Diélette, France is not the most romantic harbour town you’ve ever seen, but we were excited. This was our first sailing trip since 1999 — 13 years! 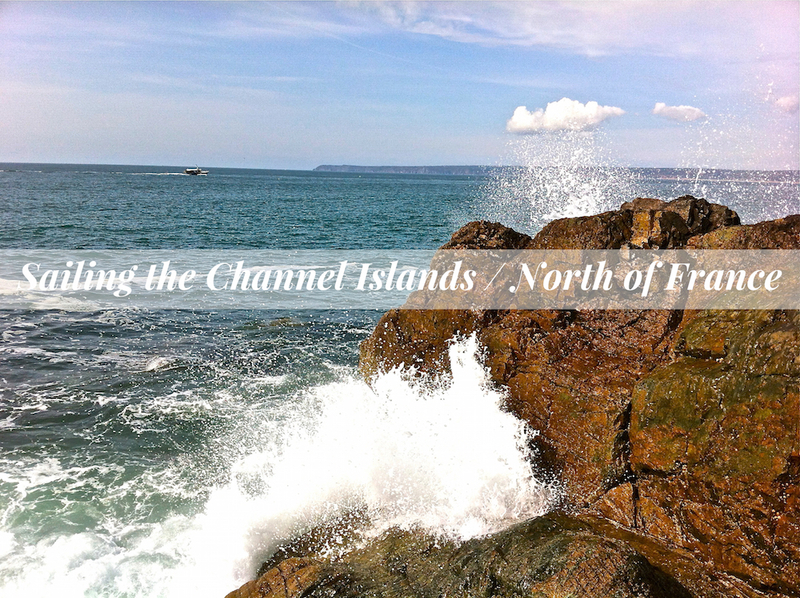 We had taken the TGV to Paris and then switched to the regional railway north to Cherbourg. A short taxi ride later, we were in Diélette, on the coast of Normandy. Again, this is not the picturesque little french harbour town in which you’d want to spend your honeymoon. Or even a weekend. It is, however, a great starting point if you want to explore the charming Channel Islands, as it’s located on the peninsula of Cotentin, east of Saint-Malo. Three boats were charted by the Swiss Cruising Club in Geneva and we were assigned to a 37- foot Salona. Our goal: to get in 300 nautical miles and gain experience with tidal calculations and navigating with strong currents. The Salona was a bit crowded for six adults as it had only two cabins and one heads. In addition, the two-burner stove had only one burner that worked, and the VHF radio died on the second day of the cruise. We had an engineer, a brilliant handyman, and a physicist on board, but neither could get the second gas burner nor the VHF to rise from the dead. Be very careful when choosing a charter company from France! We were there during high water springs, 10 days after the spring equinox. giving us enormous tidal ranges during the week, the highest being 15 meters! In St.Helier, Jersey, the walk at low tide up the gangway from the pontoon was like walking up a mountain in the Alps. 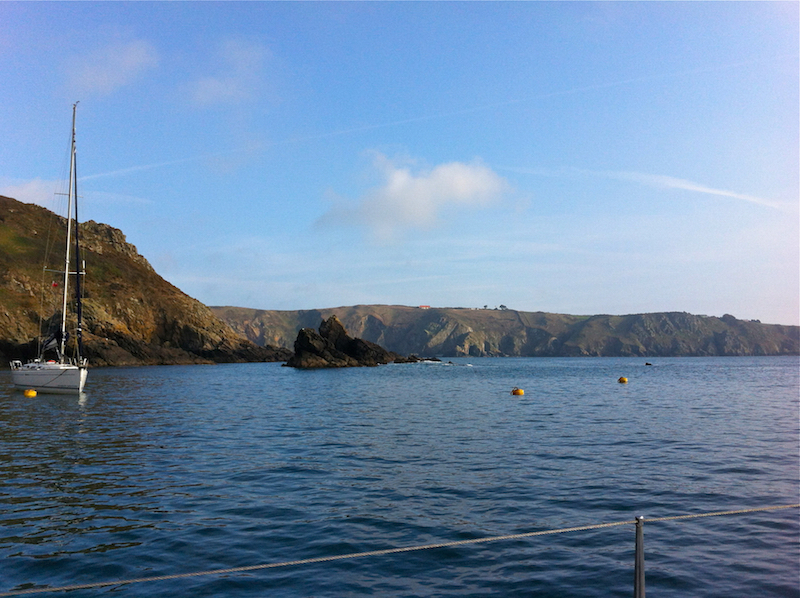 Needless to say, we had lots of practice calculating currents and tidal windows throughout the week as we visited the various channel islands (Sark, Jersey, Guernsey, Alderney) as well as Saint Malo and Saint-Quay-Portrieux. 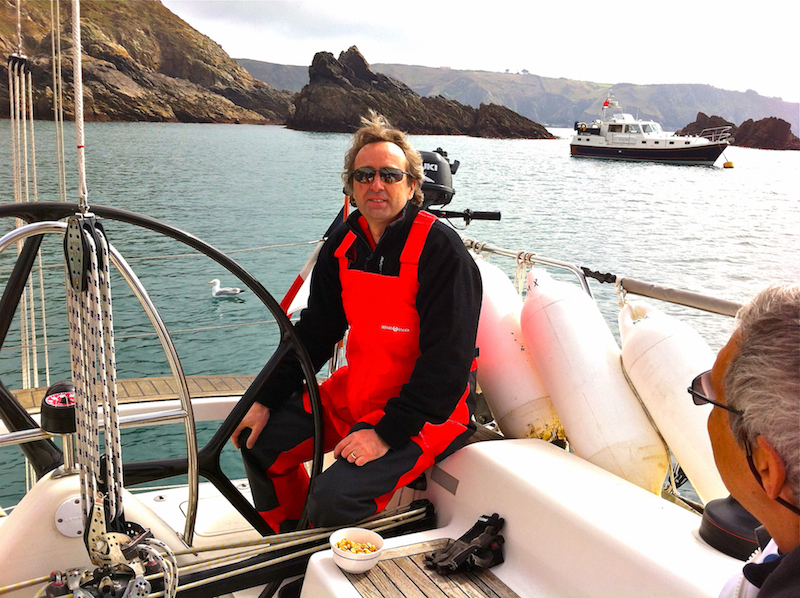 On a mooring buoy outside the island of Sark, Channel Islands. A view of the automobile-free island of Sark in the Channel Islands. St. Helier in Jersey was our favourite stop. The facilities and showers at the guest marina were spotlessly clean and seemed to be recently renovated. The fee was included in the mooring price, so you can have as long a shower as you want. We didn’t use the laundry facilities so we can’t comment on them. Wifi is also included in the price, but not electricity. The town of St. Helier is early 1960’s charming. The entire look and feel of the place makes you think of a vintage British film. Jacques and I explored the town and found some great things to take back home and to share with the others: delicious chocolate made on Sark, fantastic scones and pasties still warm from the oven. We also found some clothes, shoes, and gear as the prices seem to be a less expensive than those in the UK or France. We enjoyed a delicious seafood dinner at the Royal Yacht Hotel on the seafront (restaurant Zephyr). It has a lovely sun terrace but for us it was a bit too cold to dine outside. 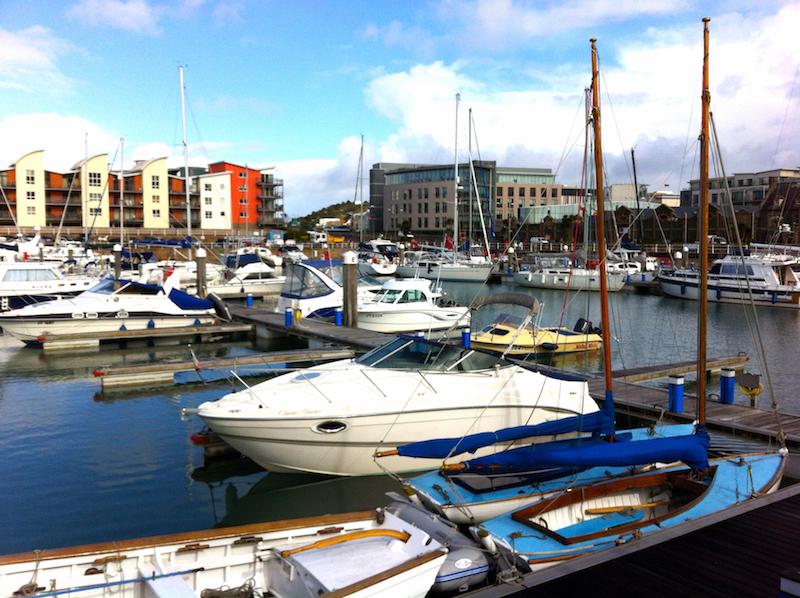 Access to cafés, restaurants, bars and shopping as the marina is in the centre of town. 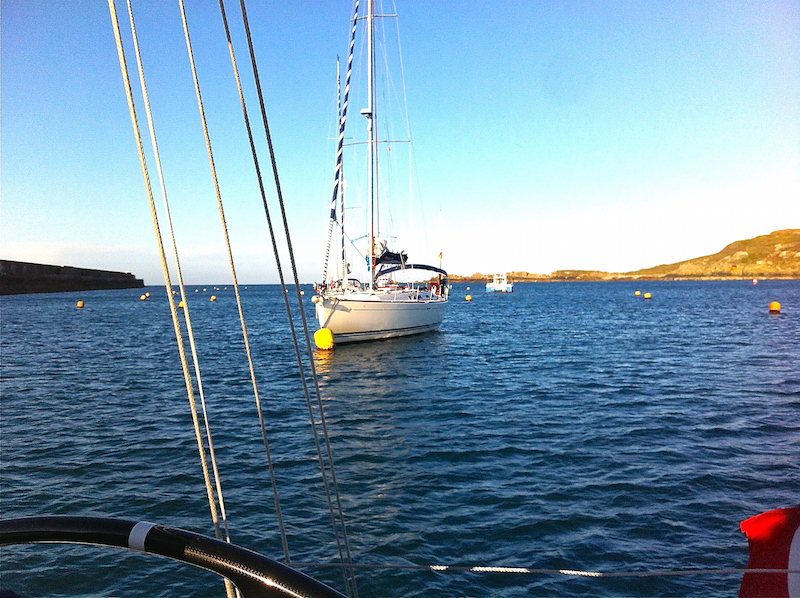 Rates: for the 11-meter boat that we chartered: £30.00; for 17-meter Freja it would cost £63.00. The tiny island of Alderney was a favourite of the crew as well. 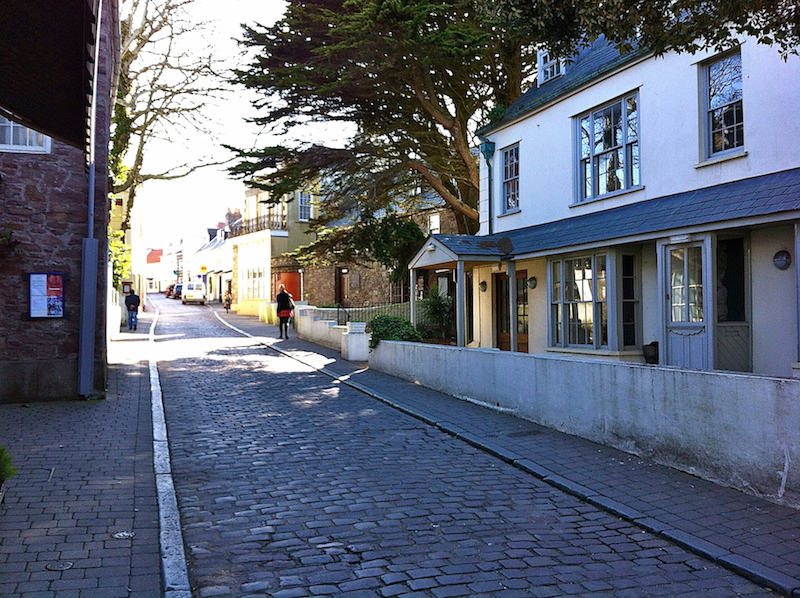 If St. Helier is 1960’s charming, then Alderney is 1950’s charming. There is no marina in Braye Harbour — you need to catch a yellow mooring buoy in the well-protected harbour. You can also anchor in the middle of the harbour – the bottom is generally sand, through there may be some rocky or weedy areas. To get to the shore, you can call the “RIB taxi service” or use your own dinghy. As the dingy on our charter boat was a bit deflated, we chose the taxi. We went to the harbour office to clear customs and have a hot shower. The facilities are clean and modern, though rather limited (only two showers on the ladies side). The showers are closed during the winter though, so we were lucky that April is considered “summer” on Alderney. We walked up the hill to the town of St. Anne, in search of an authentic Alderney pub. And we found it in the Diver’s Inn, where we enjoyed a round of cider and beer. The atmosphere is “local vintage pub” complete with dartboard and scores table on a chalkboard. Early Motown hits played in the background. Saint-Quay-Portrieux is a fishing village and touristic coastal town on the Côte d’Amor in Brittany. It’s a handy marina because it’s not restricted by tidal levels so you can come and go when you please. 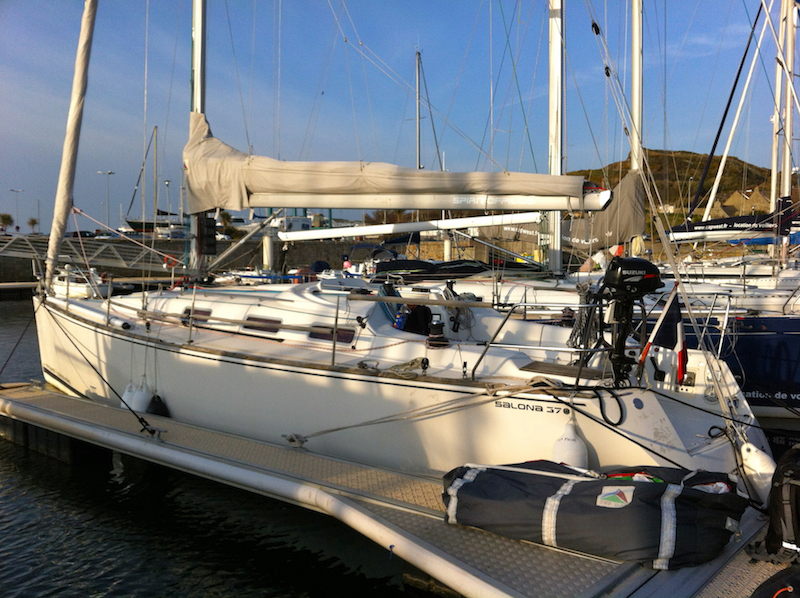 Deep sea marinas like this are rare on the Brittany and Normandy coast. It’s also one of the few marinas that have a pump-out service for your black water tanks and is a certified “Blue Flag” marina (eco-label awarded to marinas based on compliance with 24 criteria on marina management). The Côte d’Amor is famous for its rocky coastline interspersed with sandy beaches and boasts some of the finest landscapes in France. Unfortunately, we didn’t have much time to sight-see but we did manage to come away with some delicious souvenirs of Brittany – several tins of Sablé Breton (Brittany shortbread biscuits)! Toilets, showers, laundry facilities. The showers work using tokens that supposedly last 5 minutes each, but they don’t! Put in twice as many tokens as you think you need as my experience was that they last only one minute each! It’s not pleasant to have the shower stop when you haven’t even rinsed the shampoo out from your hair. 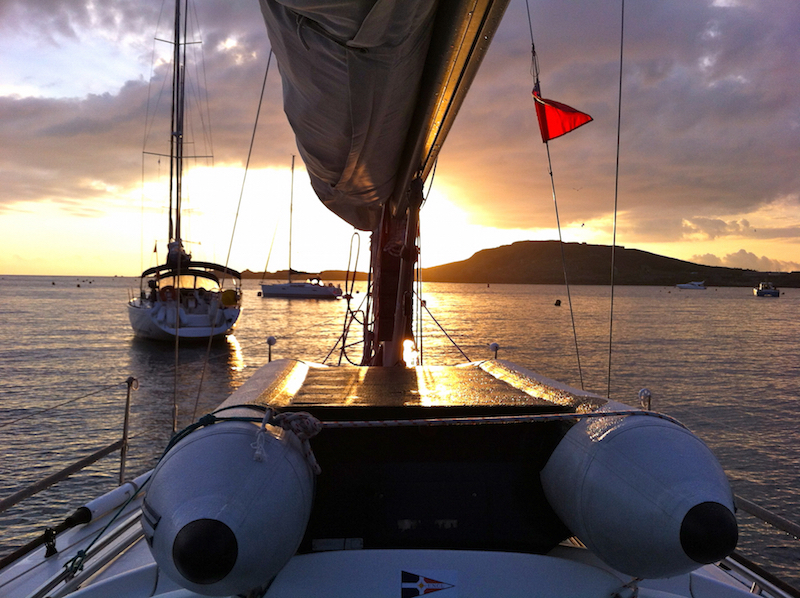 Everything you need in terms of chandlers, marine electronics shops, engineers, shipyards.